The Battle of Guadalcanal was fought between American and Japanese troops, which culminated in the victory of the former. This Historyplex post highlights the significance of the Battle of Guadalcanal. The stark cultural barriers between the Japanese and the Americans were rather obvious during the war; apparently, towards the end of the battle, the defeated Japanese troops preferred to drown or be eaten by sharks rather than be saved by American ships. Guadalcanal is one of the islands of the Solomon archipelago, situated in the Far East. It served as an important strategic base that could be used to control the gateway to Australia and the central Pacific region. A major battle to wrest control of Guadalcanal was fought between the U.S. and Japanese troops from August 7, 1942, to February 9, 1943. The Battle of Guadalcanal ended in a decisive American victory, despite losing more troops and equipment in the process. After losing significant number of soldiers and ammunition towards the end of the war, the Japanese surrendered, never to make any further attempts to recapture the island. The Battle of Guadalcanal lasted for about six months, even more perhaps. The paragraphs below will explain why the Battle of Guadalcanal was important, and provide you with a gist of the entire war in the Pacific theater. In December 1941, the Japanese attacked Pearl Harbor, rendering much of the U.S. fleet useless. The main goal of this attack was to establish control over the U.S. naval force, and use the rich natural resources in the Far East and to protect their empire in the Pacific. To achieve this goal, Japan gained control over the Philippines, Singapore, Thailand, Guam, Gilbert islands. As a part of their strategic initiative, the Japanese found it inevitable to extend their control to the central Pacific area, from where they could threaten Australia or the West Coast of the U.S.
Guadalcanal is situated in the far east of the Solomon islands, in the Central Pacific area. Back then, it was a part of the British colonies, and the islands were an easy gateway into Australia. Thus, it was captured by the Japanese in May 1942, from the British. They even began constructing an airfield on Guadalcanal so that it would serve as a supply base for the Japanese to attack the supply routes between the U.S., Australia, and New Zealand. Therefore, it became very vital to regain control of the island from the Japanese. This was one of the main reasons why the battle is so significant. The American troops landed on the island on August 7, 1942. The first attack by the U.S. Marines was on the islands of Tulagi and Gavutu-Tanambogo. In retaliation, Japanese naval aircraft destroyed one of the prime warships of the U.S., which lead to further clashes. Some U.S. troops decided to withdraw the rest of the ships, but were subjected to a surprise attack by the Japanese on the night of August 8. More than 11,000 U.S. Marines formed a perimeter around the Lunga Point; however, around this time, the U.S. army was severely affected with dysentery and other tropical diseases. On August 12, more Marines landed on the island, who were wiped out by the Japanese soldiers. Then, on August 19, another division of marines landed on the island, successfully encircling the villages and killing more than 65 Japanese soldiers, while on August 20, two more platoons of marines arrived at the airfield. After the U.S. dispatched a huge marine squadron, the Japanese Imperial General Headquarters dispatched the 17th Army. Due to lesser available units and a comparatively stronger enemy force, the Japanese suffered extensive losses―this event is called the Battle of the Tenaru. Towards the end of this battle, more Japanese troops were dispatched to the island. On August 24 and 25, both sides were engaged in what is termed as the Battle of the Eastern Solomons, wherein the Japanese launched an air raid over the island, and the Americans destroyed a Japanese warship. By early September, air battles were in full flow over the Henderson field, which gave the Allied forces and edge over the Japanese. 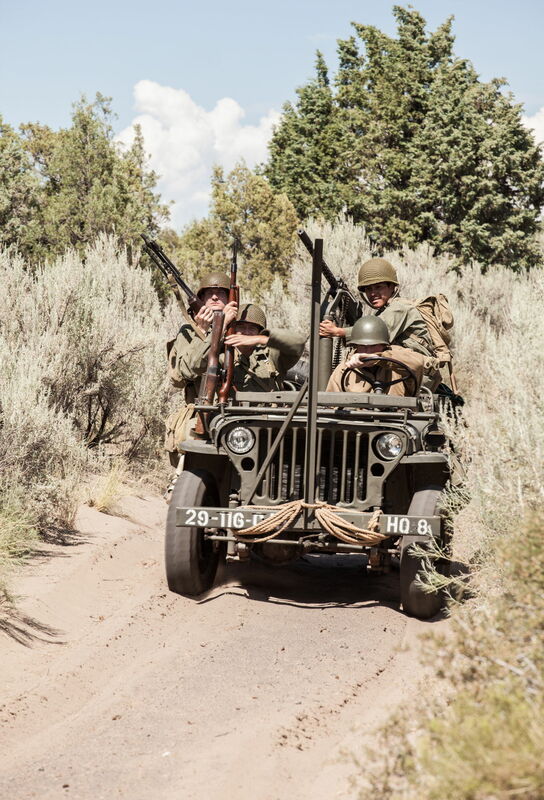 The losses caused by the air battles led to the formation of the 'Tokyo Express', a strategic plan to transport extra troops and equipment during the night so as to avoid the onslaught of the Americans during the day. This was followed by the Battle of Edson's Ridge, which recorded a loss of more than 800 Japanese soldiers and 100 U.S. Marines. In a bid to capture the Henderson field, the Japanese dispatched extra reinforcements and launched heavy air attacks; however, they were eventually outnumbered by the Marines. The Battle of Cape Esperance, or the Second Battle of Savo Island, took place in the first fortnight of October. The Japanese naval forces received heavy reinforcements and prepared to attack the Allies. On the contrary, the Allies attacked the Japanese forces, taking them by surprise, and destroyed one of their cruisers, one of their warships, and a destroyer, at the end of which the Japanese were forced to retreat. This battle marked a significant victory for the Allied forces. Undeterred by the victory of the Allies in the Battle of Cape Esperance, the Japanese prepared to strengthen their force and capture the Henderson airfield. On the night of October 14, the Japanese destroyed 48 CAF aircraft and killed 41 soldiers. They planned to attack the field from the southern point, instead of the coast, and sent 15,000 troops for the battle. However, the U.S. Marines were well equipped with heavy machine guns, artillery, and rifles, and the Japanese lost more than 3,000 of their troops in the combat. On October 26, both opposing forces were involved in heavy air attacks as well as naval attacks, resulting in the loss of two naval carriers and aircraft on either side. By November, the Japanese army was greatly weakened, and needed further troop reinforcement to prepare for another attack. The Allies got wind of the fact that the Japanese were planning further attacks, and thus began the naval battle of Guadalcanal. The resulting clashes led to the loss of three warships, heavy cruisers, light cruisers, several destroyers, and a number of troops. By the end of December, the Japanese were planning to secretly evacuate due to the heavy damages sustained. Officially, this took place in the first week of February, resulting in victory for the Allied forces. ◆ Capturing Guadalcanal was vital for the Americans, to protect Australia from a Japanese invasion, and to secure the communication lines between Australia and the U.S. The battle ensured safety of the sea route. 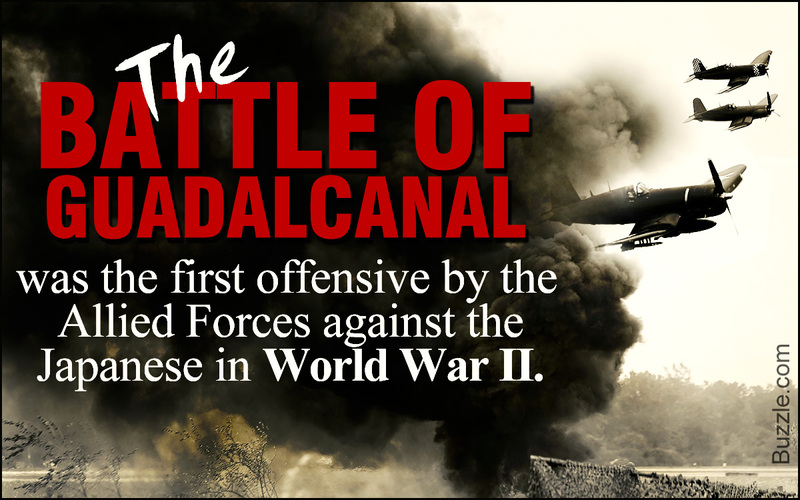 ◆ The Battle of Guadalcanal involved a complicated series of battles on land, sea, and air. ◆ The defense of the U.S. Marines is noteworthy, since it helped gain superiority in the air. ◆ The Australian land army had defeated the Japanese in New Guinea. This was the first significant land defeat for the Japanese, which was the beginning of the end of Japanese authority on Guadalcanal. ◆ This battle caused severe men and material losses for the Japanese. The victory of the Allies laid the foundation for the eventual surrender of Japan in World War II. ◆ This battle was one of the longer-lasting battles in the Pacific theater. More and more mechanized reinforcements were used; the U.S. emerged as the foremost provider of ammunition and artillery. As the battle prolonged, the Allies were met with increasing resources, while the Japanese lost most of their warships and other military transport. ◆ While the Battle of Midway laid the foundation for the supremacy of the American naval forces in the Pacific, it was the battle of Guadalcanal that helped the American Navy to firmly establish their supremacy in the Pacific. ◆ The Australian counteroffensive in New Guinea contributed to the capture of the islands of Buna and Gona, and eventually led to the Japanese losing out on every one of their captured islands. ◆ The battle helped the U.S. gain a strong airbase to control the region. ◆ The loss of the air superiority due to this battle delivered a severe blow to the strategic plans of the Japanese. ◆ The Japanese and American troops lost so many ships during the war; the area came to be called, the 'Iron Bottom' Sound. ◆ The first U.S. unit to be involved in the battle was the newly-formed 1st Marine Division. It shifted from the U.S. East Coast to New Zealand in June 1942. ◆ The hot, tropical climate of the island was too much for both parties. It not only affected the communication lines between the inland and the troops, but also severely affected the health of the soldiers―from the beginning right till the end. Several thousand soldiers were reported to have died from tropical diseases. ◆ Initially, the unfavorable climatic conditions forced the Americans to cease any form of communication with the Japanese; thus, for the first 24 hours after landing, there was no war on the island of Guadalcanal. ◆ Reportedly, the U.S. lost approximately 7,000 men. They also lost more than 29 ships―8 cruisers, 2 heavy carriers, 14 destroyers, and 615 aircraft. ◆ Like the U.S., the Japanese too sustained heavy losses. The Battle of Guadalcanal witnessed approximately 34,000 Japanese casualties, with the capture of around 1,000 soldiers. The Japanese also lost more than 38 ships, including 2 battleships, 4 cruisers, 1 light carrier, 11 destroyers, 6 submarines, and around 880 aircraft. ◆ The Battle of Midway is considered to be a turning point in the Pacific war, since Japan lost 4 aircraft carriers and many experienced pilots. The Battle of Guadalcanal was a major turning point in the Pacific theater of World War II. Post the Battle of Midway, the Allies gained an upper hand. The island was developed into a military base for future Allied offensives. The battle, thus, provided a boost to the Allied Powers, and laid the foundation for further operations across the Pacific.